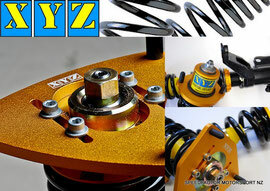 Speedfactor Ltd is the sole importer and distributor of XYZ Racing products in New Zealand. We have been dealing with XYZ-Racing for nearly a decade and have had enormous success with the product on both the road and track conditions. You can find XYZ- Racing products throughout many race classes including BMW race classes, Honda Cup, SS2000, NZGT4 GT3 GT2 , NZ Endurance series & Targa NZ. Speedfactor was formed in 2001 by racing enthusiasts interested in being able to supply performance aftermarket parts which were lacking from our market place. Over the years Speedfactor has grown to be one of the leading importers and distributors of aftermarket performance car parts in NZ. The advantage in dealing with Speedfactor is not only do we sell parts, we also have a fully equipped mechanical workshop where we specialize in most forms of vehicle preparation, from engines, suspension and brake upgrades. You can rest assured you will have comprehensive back up from any products you buy from Speedfactor Ltd.